Recommended to: Readers who enjoy historical fiction, especially when it comes to early New Orleans! I must say that I am wholly impressed by Leigh T. Moore's newest book! 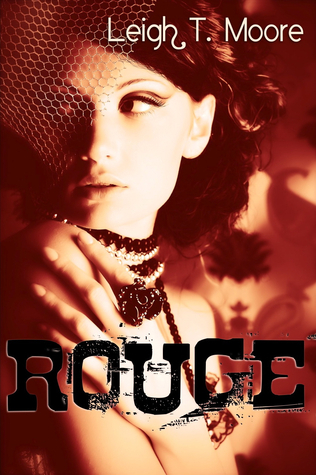 Rouge is one heck of a read. I came for the story, and fell deeply in love with everything about it. By the end my mouth was gaping open, my eyes were a little teary, and all I wanted was more book. Indie fans rejoice! This is a gem, and I know you're going to want to snag a copy for yourself. Our narrator, Hale, is portrayed vividly and is easy to fall in step with. Growing up in the back wings of a cabaret, Hale has quickly learned that the only way to survive is to play the game. Her plan is to shine as the star of the show, snag a rich man, and have him take her away forever from her old life. Everything is going perfectly, until Beau comes into the picture. A sweet stagehand with nothing to offer but his love, he throws a gorgeous wrench into Hale's story and it brings everything to life. Truth be told, all of the characters in Rouge are wonderfully rendered. There isn't a single one that I didn't enjoy and think sped the story along. Reader be warned, this is marked Upper YA and Adult for a reason. There are some steamy scenes and some colorful language. Then again, keep in mind that this is a story about a 1890's cabaret. In my honest opinion there wasn't anything that didn't belong there. Each aspect that Moore writes into Hale's world brings the cabaret to life. The costumes, the crowd, even the seedy goings on backstage, all conspire to draw you in, and keep you hooked until the inevitable end. And what an end it is! If I'm being honest, there is really nothing that I didn't love about Moore's story! The characters are well written, the setting portrayed with sumptuous perfection, and the plot is compulsively readable. It's the type of read that flies by, and then leaves you wanting so much more. I can promise that is you enjoy historical fiction that is on the lighter side, this is for you! Rouge comes at you highly recommended from this bookworm.